This week’s member blog post of the week comes from Experts Exchange Premium Service Member saxophobe. You can follow his blog “Your System Did What Now?” to hear thoughts on the tech issues he faces. 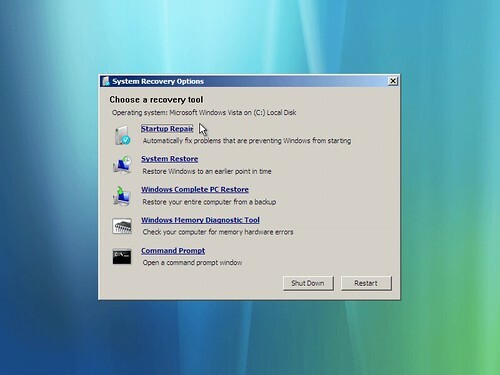 Today’s post (originally published here) discusses the trials of using Windows 7 startup repair. One of the most bizarre things I’ve ever seen happened yesterday. I did some searching and couldn’t find anyone else having this particular issue, but I’m sure someone else has. I’m still in shock, but not surprised. Yesterday I had a user that could no longer use her Bluetooth mouse with her Dell Latitude E6410. This has happened before and I resolved it by downloading/installing the latest, greatest driver. Simple. Since this happened again, I decided to call Dell and see if there was a known issue that I couldn’t find in their KB. After speaking with support for a few minutes, I found there is such an issue that started with Vista that presented as extraneous entries in Device Manager. The Dell tech recommended uninstalling all of the bluetooth entries, rebooting the machine, then reinstalling the latest/greatest. Again, simple. During the install of the drivers, the install hung for 10 minutes. Now, it IS a large driver install, but not 10 minutes of no activity big… In any case, the Dell tech and I concluded that we needed to kill the process and reboot. Upon doing that, the system BSOD’d and would not allow me to get to the Advanced Boot Options. My only option was to go thru the Startup Repair. Well, the Startup Repair ran for about an hour and a half and at the end, reported that it could not repair the system. It also ironically offered the option to reboot (if you can’t fix it, why am I trying to boot into a broken system?). In any case, I clicked the reboot button and it DID boot into normal mode! Very strange. What I also noticed is that I started getting error notifications from printers/applications about missing files. This was starting to get weird. One of the files missing was the Data.cab file from Adobe Acrobat. At this point, I’m really scratching my head. Upon further investigation, I found that ALL the Adobe products were damaged in some way as to produce an “Application is damaged. Error code 1. Contact Adobe Support” message. I’d never seen this before. It wasn’t too long after that that I realized that most of the user’s documents were gone. Luckily, I checked the backup logs and found the last complete backup was early yesterday morning, so we are good there. But still, 25 GB of data GONE? At first I was thinking I might be able to piece this thing together, but when even the installer files are missing and you can’t even uninstall applications, the decision has been made for you that this is a lost cause and that you need to rebuild/reinstall/restore immediately. Luckily, I had a new machine to migrate this user’s data/applications, and am in the arduous process of pulling the 25 GB of data down from the cloud to restore onto this new system. I still have to install a few apps, but nothing major. Because I couldn’t uninstall Adobe CS, I had to call them and reactivate on the new hardware at the cost of an hour on the phone. At this point, I’m tired and furious at the process of Microsoft’s “Startup Repair.” Since when does a repair touch ANYTHING other than system files? I can understand a CHKDSK /f /r, or SFC /SCANNOW, but why would a “repair” touch data? And not just user files, but application files too? Does anyone know? My final thought is this: This was not a Startup Repair. This was a Startup Destroy. A word of advice to Microsoft: If you wish to remain competitive in the global market, you will HAVE to do better.